Our tent trailer doesn’t have a step built in, so we had been using a fold-up plastic step. 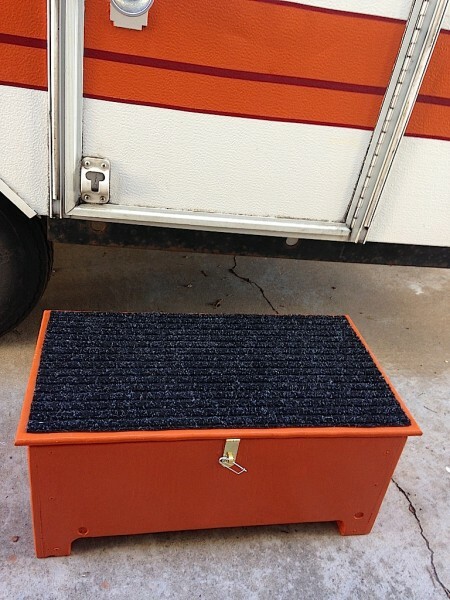 Unfortunately, our cute little red step collapsed on us last camping trip, so we decided to make a new one. 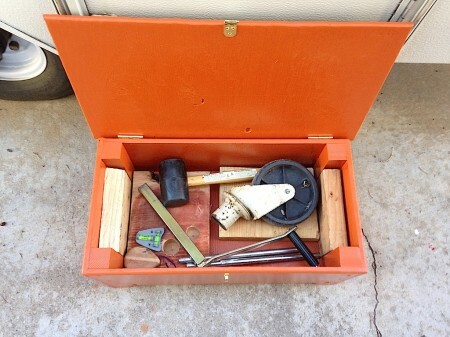 We made a trailer step that could double as a toolbox. I found this advertisement in the April 1970 National Geographic. Want to visit exciting new places? Or maybe you’d prefer sunbathing in Florida or relaxing beside some inviting stream? Perhaps you know a road somewhere you’d like to follow to the end. 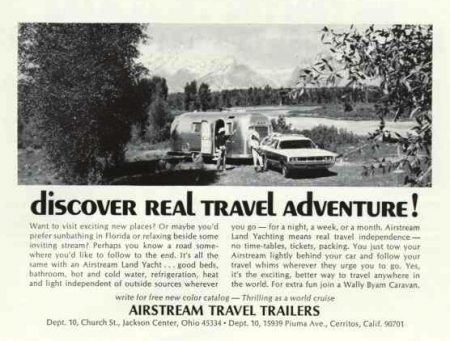 It’s all the same with an Airstream Land Yacht… good beds, bathroom, hot and cold water, refrigeration, heat and light independent of outside sources wherever you go – for a night, a week, or a month, Airstream Land Yachting means real travel independence – no time-tables, tickets, packing. You just tow your Airstream lightly behind your car and follow your travel whims wherever they urge you to go. Yes, it’s the exciting, better way to travel anywhere in the world. 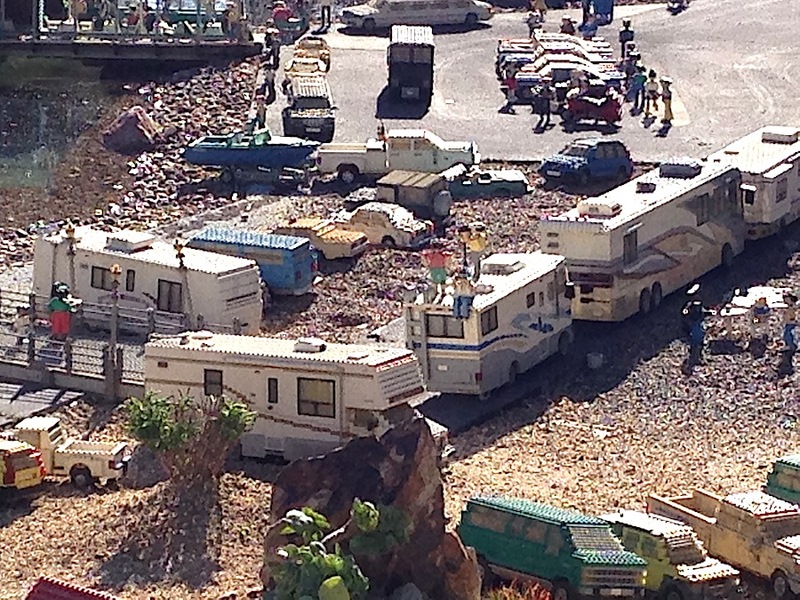 For extra fun join a Wally Byam Caravan. write for free new color catalog – Thrilling as a world cruise. That is exactly what I love about camping in my tent trailer. I don’t have that bathroom or refrigeration, but I do have that freedom. There are so many campgrounds with hookups that I feel as if I can travel anywhere with my camper. They have many rallies where they get together. In my region alone, there are four rallies planned this summer. I’m seriously impressed that they are still around and getting together. Unfortunately, I would have to buy a $40K camper to join them, but I am encouraged that they are still around. 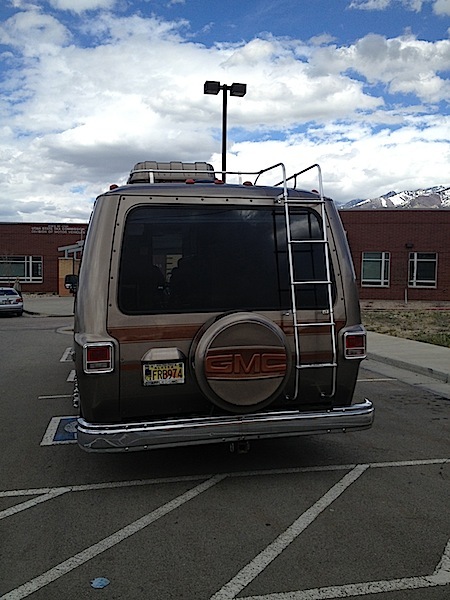 When I was registering the Jayco Tent Trailer way back when, I saw this GMC motorhome in the parking lot at the DMV. 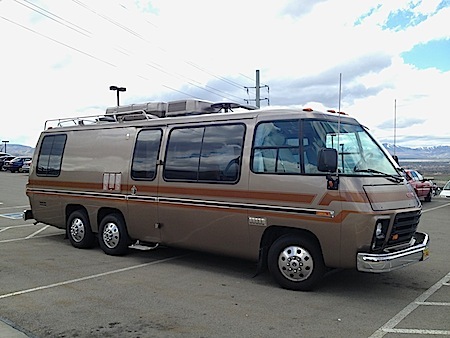 Even though I had just gotten what would be the best camper I have ever owned, I still salivated over what I consider my dream motorhome. This is very much like my childhood toy, the Barbie Star Traveler. 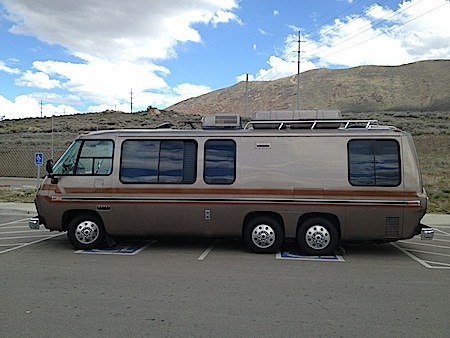 I had many dreams of traveling in a motorhome that looked like this, but bright, bright yellow. It is nearly four years later and I still adore this motorhome, even though I love my tent camper with just as much adoration. 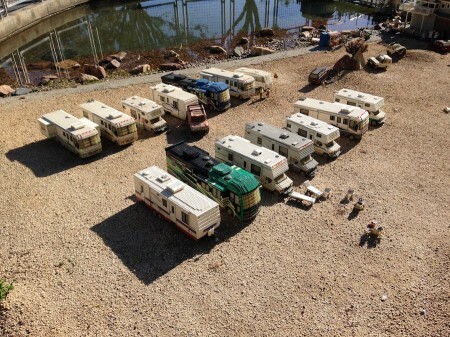 In the end, I can’t own ALL the campers. I have to choose one and the tent camper works best for us. The GMC Barbie Star Traveler will have to stay a childhood fantasy. 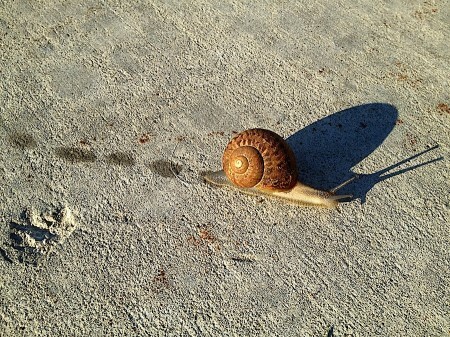 I took this photo on one of my walks with my dog. This snail represents everything I love about camping with our little tent trailer. I love that I can carry my house on my back. My bed smells like me. I can cook myself some yummy food for dinner. It all feels so familiar because we have slept so many times in that tiny trailer. There is something so comforting about carrying my home on my back. That’s why I love traveling with a camper. 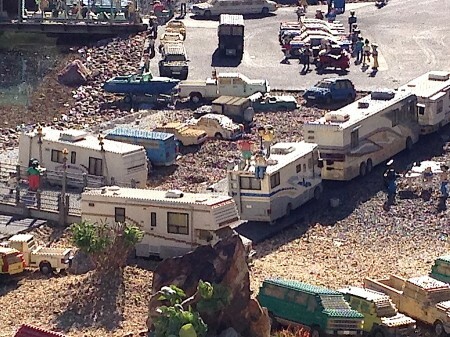 When we went to Legoland last year, I snapped some shots of the RVs that they had built in their Legoland towns. 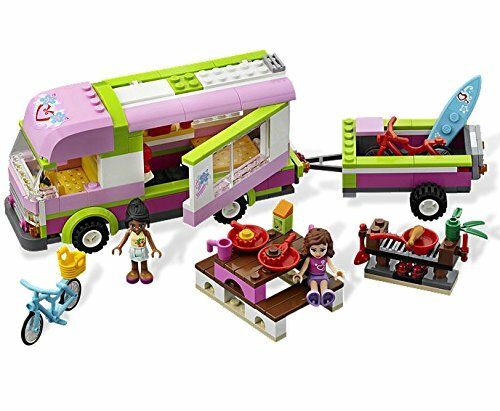 We might not be able to own the RV of our dreams, but we can build one from Legos! 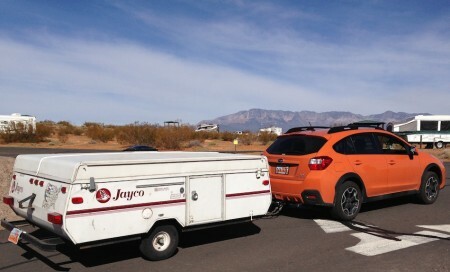 I don’t know how I missed it, but there is yet another Canadian wonder building lightweight campers with the bare essentials that can be towed with regular cars. These campers are perfectly small and are easily towable, both being under 1500 lbs. Unlike the T@B campers, they look like lopped off regular campers, which are cute in their own right. There is no pricing available on their website, so I have no idea how affordable they are. 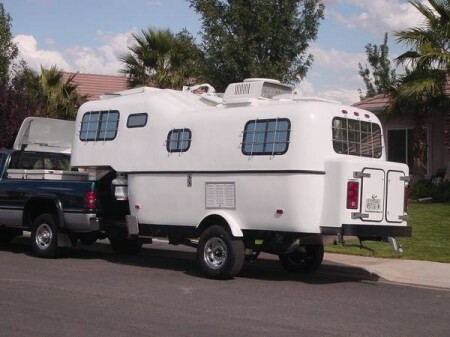 When is the U.S. going to start jumping on the truly light weight camper bandwagon?! I found this Scamp Fifth-Wheel for sale on Craigslist and it amused me greatly. I love it when people put their own personality into a camper and this camper now has quite a bit of personality. I have finally done it. I have made a good awning, that is lightweight, adorable and sturdy in the wind! This video is EXACTLY why I love my tent trailer and would rather stay in it than a hotel room. You load your luggage once. No packing and unpacking in each city you stop. You have your own closet and sleep in your own bed. You have your own stocked refrigerator, not a mini-bar with overpriced items in it. You can cook healthy meals in your RV and save money. You know who slept in your RV bed the night before. 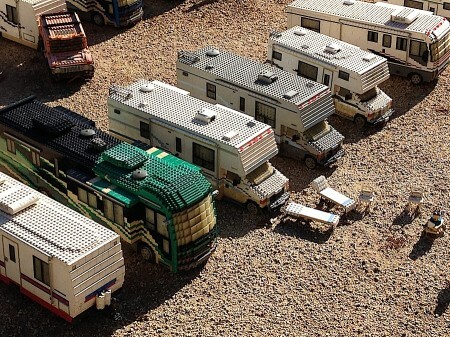 Your RV is cleaned by you, so you know how clean it is: no bed bugs, strange bodily fluids or uncleaned glasses. Hotels are not always near the places you want to visit. No elevators or long hallways to negotiate with luggage. Just pull into your spot and go. You meet cool people at campgrounds. RV campsites cost less than hotel rooms and are sometimes free. This is a great list, but it’s kind of skewed toward luxury RVs, which are EXPENSIVE!! How does it compare to a cheap hotel room? 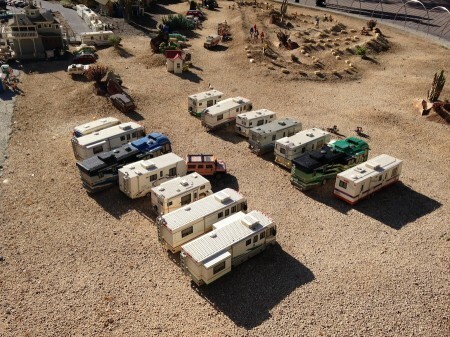 Easier to park than a huge camper. We literally can ROLL it into the campsite by hand if we need to. A spot near the campground bathroom is WAY better than emptying a black water tank. We only spent $1200 on the camper two years ago. No payments. 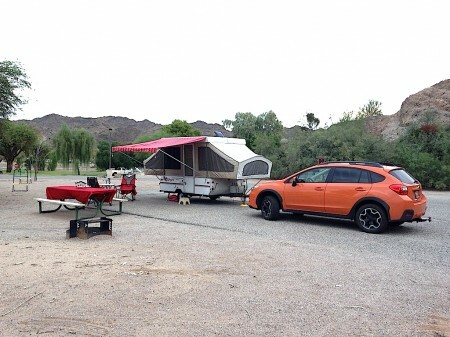 Those inexpensive campsites really do cost LESS than a cheap hotel room because we didn’t pay a ton of money for our camper. We can still sleep in our own bed and cook our own food. 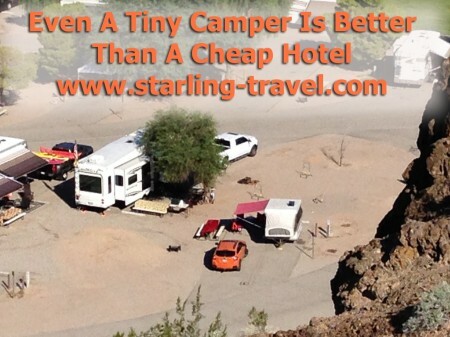 We get 25 mpg with our car pulling our tent camper, so gas is as cheap for us as it is for a hotel traveler. I have no desire to go back to hotel traveling. Whenever I have to stay in a hotel, I feel put out and miss my little tent trailer. 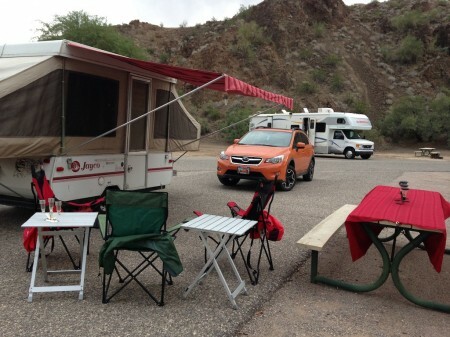 If you feel as if camping in an RV is roughing it, you have the wrong idea. 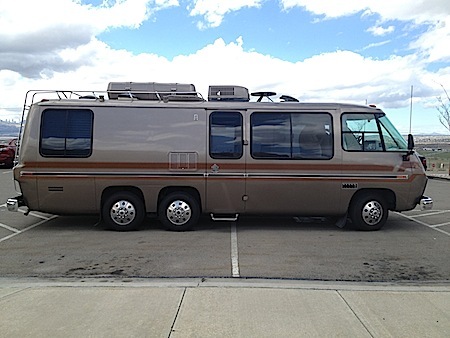 If you WANT to rough it, then I understand how sleeping in an RV might not feel right, but if you just want to travel the country and enjoy beautiful views, then an RV is the best way to go. This video is a nice and quiet walkthrough of the RV/MH Hall of Fame in Elkhart, IN. I so want to go there and look at all the old trailers in person!